Cacodemons, regular demons, imps, a Cyberdemon, Barons of Hell and a lonely Doomguy, all present. 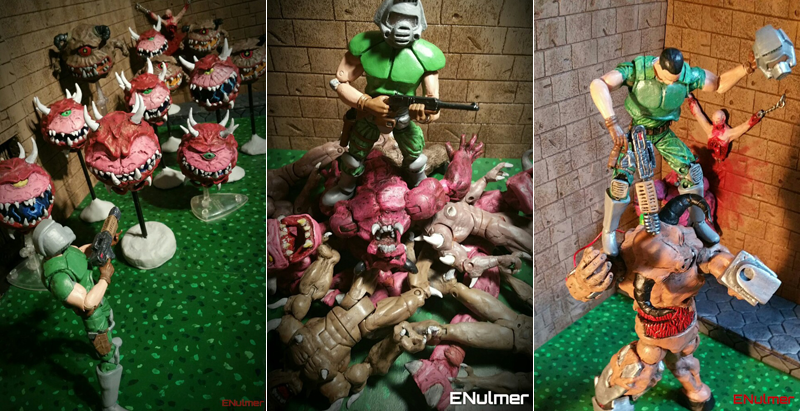 Artist ENulmer made some fantastic Doom props including almost all the classic monsters. Some of them, such as the Doomguy, are modified versions of other action figures, but most of the demons are hand sculpted and painted. They all look fantastic... and a bit cute too. Those Cacodemons look rather like sidekicks from a Saturday morning cartoon than fiends from hell.